I read the wrong book; seriously, who does that??? 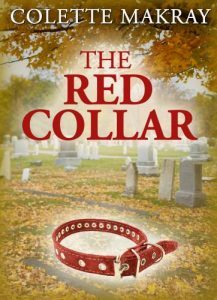 The Red Collar was recommended to me by a friend who’s book club had read it. She said it was short and a really good read. So upon searching Google, Goodreads, and Amazon, I found several books with the same title. But one in particular stuck out and seemed like it was ‘the one,’ so I read it. Soon, I realized it was the wrong book. But I didn’t care. At 50% through, it dawned on me that I was supposed to be reading about a man and dog associated with the military, set in the early 1900’s. Not a single mother struggling with loss and an elderly man doing the same. They meet periodically at the cemetery. Both grieving. Both trying to move past the hurt that death and loss often bring. At the center of this poignant short story is a dog. 2 dogs really. And the love between man and man’s best friend. Loyalty. And the enduring, often magical, thing we call life. Since I bought this as an e-book, I’m not entirely sure how many pages it is, but I think it’s somewhere in the neighborhood of 16. A very fast read but one that will stay with you. I think it’s somehow fitting that my first read of 2017 is one that ends with the realization that, life goes on.